Criminology is a branch of social science that is primarily concerned with the scientific study of crime and the effect it has on society. In criminology degree programs, students understand and explain the root causes of crime and its consequences for the society as a whole. Criminologists play an important role in stopping crime by analyzing statistical data to figure out factors that prompt people to break the law. With a degree in criminology, you can pursue a number of careers in the criminal justice field as well as venture out in the fields of private security, public policy and social services. While the specific admission requirements may vary with different institutes, generally, in order to enroll in criminology degree programs, students need to have at least a high school diploma or a GED certificate. They may also have to present their official academic transcripts, curriculum vitae, a completed application form as well as legal documents (birth certificates, identity cards etc). Students may also have to write a statement of purpose, explaining why they are interested in pursuing a degree in criminology. They may also have to obtain character references from their previous instructors or employers. Criminology degrees are usually offered at the associate, bachelor, master's and doctorate level. Associate degree in criminology: An associate's degree in criminology is typically a two year program. Students usually take introductory courses and learn about the fundamental theories related to justice administration and criminal law. Bachelor degree in criminology: A bachelor's degree in criminology typically takes about four years to complete. Students get a chance to study a variety of courses ranging from social sciences to victimology and legal processes, in a comprehensive fashion. Bachelor degree programs in criminology offer an extensive analysis of the political, environmental and social behavior that spurs deviant behavior in people. Master's degree in criminology: For criminologists hoping to work in the field, a master's degree in criminology is essential. A Master's program can typically be completed in two to three years, depending on the curriculum specifications. Students will also be required to complete a thesis project or a dissertation. Students will take advanced courses that will help them in their professional work in criminology. Doctorate degree in criminology: A doctorate degree in criminology usually prepares individuals for an academic career, teaching students at the university level as well as carrying out scholarly research. A doctorate degree in criminology may take about four to seven years to complete. Students will need to undertake extensive research and write a thesis or dissertation on a specific topic in criminology. Nowadays, many students are pursuing online degree programs owing to their convenience and affordability. Students no longer have to commute to campus and be physically present in classrooms. They can study whenever they like and wherever they like. The coursework of a degree in criminology is similar to any traditional class room based curriculum. Students get to study from a variety of multimedia techniques such as webcasts, podcasts, videos and online lectures among others. Working professionals pursing an online program can study at their own will without disrupting their work routines. Is the Criminology degree online affordable and what are the contents of the course on Victimology? What jobs should I be applying to after my criminology degree? Will the online criminology degree cost less than an on campus degree? Q:Is the Criminology degree online affordable and what are the contents of the course on Victimology? A:If you are asking is the Criminology degree online affordable, then the answer is yes. This is primarily because in the online variant, you can save the expenses of travel and text material. One of the major courses of this degree program is Victimology. This course is worth 4 credits in total and allows the students to have complete inspection of the classic theories as well as contemporary ones on methods to understand the various crimes and how to prevent any victims. Q:Can you tell me about criminology degree requirements and subjects? A:Criminology degree requirements will differ according to the level of degree being pursued. With a bachelor's degree you can enter the law enforcement field. Different positions may require specified training. Generally, criminology degree studies criminal psychology, corrections, juvenile justice, social behavior, patterns of crime, investigative methods and the legal system laws. Q:My search on affordable online colleges criminology led to the mention of a course in Research Methods in Criminology. Can you explain what I will learn in this course? A:The course will instruct on advanced methods of data analysis and research design. Students will learn to differentiate between experimental and non experimental methods of data design, bivariate and multivariate data analysis, and probability and non probability sampling techniques. They will also learn how to construct scales and indexes that can be used to test 'cause and effect relationships' between variables. Q:What jobs should I be applying to after my criminology degree? A:The specificity of the job you should apply to depends on your personal interests into the subject. After completing a criminology degree, you will be eligible to work at an entry level position at any of the following jobs; crime scene investigators, criminalist, latent print examiners, crime lab analyst, fire investigator, evidence technicians, etc. 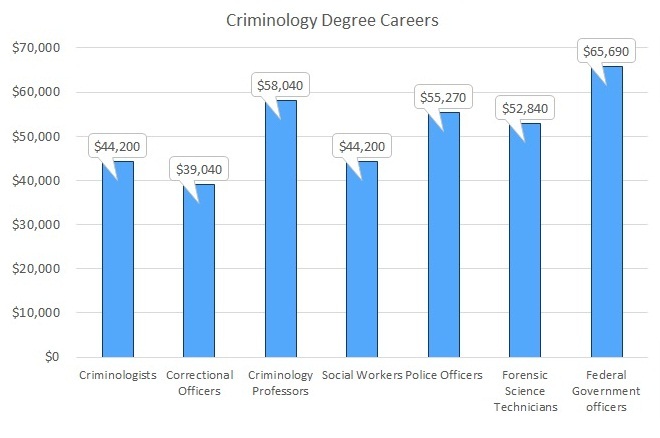 Q:Will the online criminology degree cost less than an on campus degree? A:While the tuition fee for online courses and on campus degree may be the same. There are other costs associated with attending a full time on campus degree that you may be able to save on when pursuing the degree online. These costs are transport expenses, relocation cost as well as they costs of books which can otherwise be used online. Q:Can I go for criminology degrees after high school? A:Yes, you can opt for an associate or bachelor degree in criminology after completing your high school education. There are many criminal justice schools offering criminology degrees. You can prepare for careers in criminology and join various federal and state institutions. Take a look at our page for more detail. Q:What jobs can I do after getting an online criminology degree? A:The type of job and income level you can qualify for with a criminology degree will depend upon certain factors such as specialization and level of degree. Many criminology majors join the federal sector and work in law enforcement agencies. There are also a number of private sector jobs available in this field. Common job positions one can consider pursuing with this degree are: police officer, probations officer, private detective, investigator, social worker, criminologist, teacher, and corrections officer. Q:Where do people with an online criminology degree work? Q:How long will it take to do online criminology degree? A:The duration of a criminology program will vary and depend on the level of degree you are going for. Typically an Associate Degree will take 2 years to complete, a Bachelor's Degree will take 4 years to complete, and a Masters Degree will take 2 years to complete. Keep in mind though that these timelines can vary from school to school. Some online institutions are also offering students self-paced online degrees and accelerated degrees. This means students can earn the degree in a shorter time span. Q:Why do an online criminology degree? A:A degree in criminology is geared towards equipping students with an in-depth understanding of the criminal justice system. Much of the coursework focuses upon the scientific study of criminals and crime. Students who cannot attend campus based classes due to other commitments such as a full-time job can instead pursue the program online. Students are opting for online degrees as they more convenient to cover. Online classes are flexible and give students the freedom to study in their free time. Apart from flexibility, this mode of learning is cost-friendly and efficient. Q:What are the requirements to start an online criminology degree? A:To enroll in an online criminology degree, you will need to fulfill the admission requirements of the institute. These may vary from one place to another. For most undergraduate degrees, you will need a high school diploma and transcript of records. This provides proof that you have completed the minimum education requirements from a high school. For graduate criminology degrees, you will need a bachelor degree transcript and a minimum CGPA of 2.5. Some schools may ask applicants to take an English proficiency examination and also complete pre-requisite courses such as political science, sociology, statistics, humanities and communications. Q:What you can do withOnline Criminology Degree? A:There are several careers you can consider. You can work in the Law enforcement where you will be Investigating crime scenes, developing psychological profiles of criminals, and participating in autopsy to gather evidence relevant to various crimes. You can also work in prisons where you would be required to supervise, train and educate inmates. There are positions in universities, non-profit organizations, law enforcement agencies and other government organizations that require the skills of criminologists. The career options are diverse.